Get Trotsky in 1917 and Lessons of October together for £15 – save £2.50! Trotsky in 1917 is Trotsky’s first-hand account of the Russian revolution, collecting together many of his writings throughout the course of that year and translated into English for the first time. 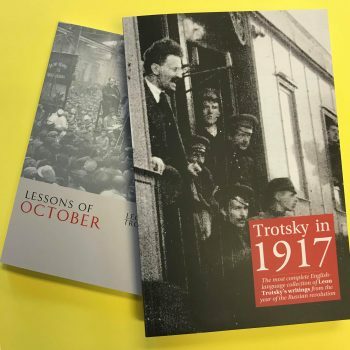 Lessons of October, written in 1924, was originally written as the introduction to Trotsky’s collected works of 1917 – but then developed and published separately not only in Russian but translated and discussed widely throughout the Communist International. These two titles together illustrate, in his own words, Trotsky’s role in the Russian revolution. They show clearly the central role Trotsky – together with Lenin – played in 1917, and the marxist ideas and programme that led the working class to victory. Socialist Books has published both titles separately, but we would recommend reading them together – and to that end we’re offering a discount of over 15% if both are bought together.